We are a global frontrunner in making oral vaccines a reality. We’ve created a proprietary Platform Technology using organic plants to manufacture Vaccines and Biologic Drugs. We have proven the Platform Technology through several grants from U.S. National Institutes of Health R&D, by a successful double-blind, placebo-controlled human clinical trial, and by endorsement of the U.S. Food and Drug Administration’s authorization of a second clinical trial on our very first vaccine. If you invest, you're betting PlantPharm will be worth more than $33M in the future. Held in Escrow & Refundable. PlantPharm must raise $100,002 to get funded. You may request a refund while funds are in escrow. 1 New Platform Technology for organic production of pharmaceuticals. 2 With our Platform, green plants are used to manufacture complex biological drugs. 3 We have the ability to transform vaccines and certain biologic drugs from needle delivery to oral delivery using plants. 4 Humanitarian vaccination efforts worldwide are enhanced by being able to administer shelf-stable, oral vaccines without the need for a cold-chain environment and a needle. 5 With our proprietary Platform we can economically produce pure biologic drugs and vaccines using plants resulting in lower costs of biopharmaceuticals in the future. It’s rare to witness the start of a disruptive technology, this will be nothing short of light bulbs to the candle industry! Unseen in the pharmaceutical industry to date, PlantPharm’s groundbreaking production platform is positioned to transform the industry! PlantPharm can produce their pharma company's products much more efficiently and at far lower costs. Providing shelf stable, pill form vaccines in place of traditional injection based pharmaceuticals, PlantPharm’s technology eliminates refrigeration chains, medical staff and other logistics needed for traditional delivery. PlantPharm’s products will allow the pharma industry to provide a much deeper market penetration as well as a much faster time-to-market. This is pure genius! We’re not selling vaccines, rather, we are using our proprietary Platform Technology to enable pharmaceutical companies to make the conversion away from needle-injected format, and into the very same vaccine in pill form. Would you rather receive your vaccine by a needle or by a pill? This graphic will show how we will collaborate with other pharmaceutical companies. Why now? Before now it would have been impossible, but thanks to advancements in gene editing, our platform technology has become a reality, something our team has been working toward for 20+ years. Which do you prefer: injection or pill? The biologic drug market is growing at nearly twice the pace of the overall pharmaceuticals market. We are raising $9 Million to be used for scaling up production, creation of new vaccines and initiation of the next human clinical trials along with development of collaborative agreements for product conversions into plant-grown with other pharma companies. Pro forma financial projections and Return On Investment are based upon Management’s current expectations concerning the Company and the Industry in which it operates. 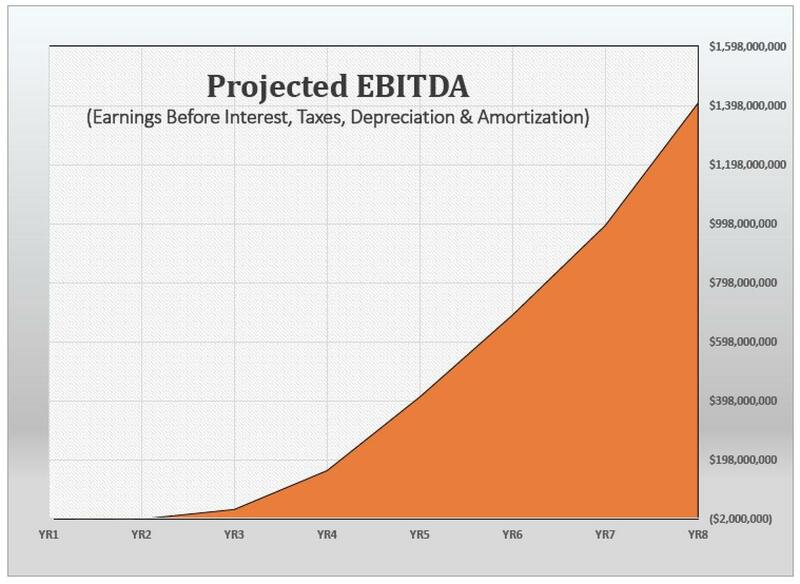 These are forward-looking projections that involve risks and uncertainties however, they also reflect probability upon comparison with other companies within the industry and comparable earnings and valuations. The development and proof of PlantPharm’s Platform Technology could not have been done without the help of formal collaborations with these Scientific Research Institutes, Universities, Companies, a Cancer Center, U.S. Government Agencies, NASA, Computer Technologists and Individual Scientists. 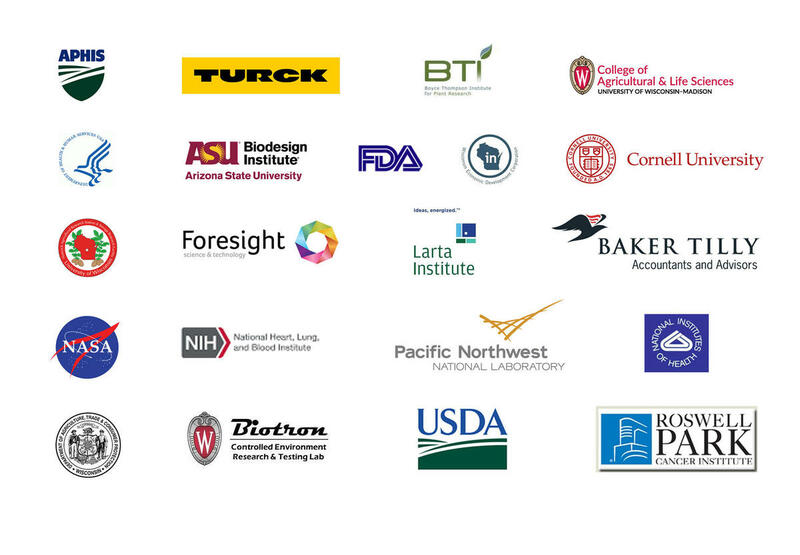 PlantPharm BioMed, Ltd. has been privileged to be associated with each of them. We will become the #1 Company worldwide for research, development and manufacturing of plant-grown biopharmaceuticals within the next four years. We intend to lower the cost of drugs by enabling the pharmaceutical industry’s ability to extend their market reach and length of time in the marketplace by converting current products into plant-grown biopharmaceuticals. This can be done at less cost and will provide companies the opportunity for serving more patients over a longer span of time. 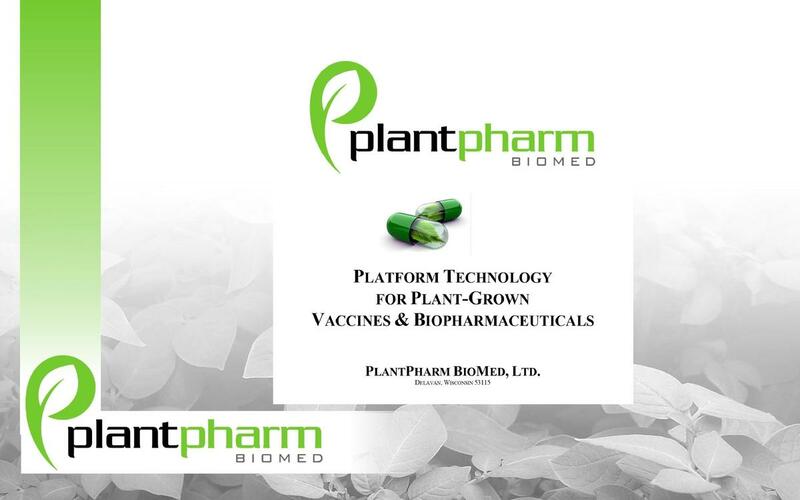 PlantPharm BioMed, Ltd. is a Biotech/Biopharmaceutical company having developed over more than 20 years a proprietary Platform production technology that allows for the creation of oral vaccines and pharmaceuticals grown organically in plants. Can you take us back to the beginning. How did you get started? The Company founder, Robert Britt, had many years of experience in seed production and genetics and was marketing agricultural seeds worldwide. He was at one time, the largest exporter of U.S.-grown hybrid seed corn in the world through his personal company. The development of this proprietary Platform Technology in the pharmaceutical field began with a unique patent that he purchased while on international travels. The next years were spent in automating, then documenting the abilities of the platform to produce pathogen-free, high-speed production of plants in controlled-atmosphere conditions for the early production of seed crops. He worked with a NASA commercial center at the University of Wisconsin and his plants were flown on the Space Shuttle Columbia and later in the International Space Station where they produced a crop of small potatoes. During this same time a consortium of Universities around the world mapped the first genome of a plant. Biotechnology took a leap forward in plant genomics and suddenly Britt’s work was noticed on an international basis. As a result he was able to grow the very first crop of vaccine-bearing potatoes using the new Platform Technology. Britt has now grown in potatoes the) Hepatitis B and Norwalk Vaccines, and Thrombin, a proteolytic enzyme that facilitates the clotting of blood. FDA required cGMP documentation was then adapted for plants by Britt, a Biosafety Level 2 Laboratory was built and federally inspected. A Pilot Platform for growing biopharmaceutical plants was built. Britt has worked in collaboration with three Land Grant Universities, two biotech Institutes, a major cancer research center and one of the only Biotron’s in the world. A group of experts in their fields have been assembled over the years and enables us to staff our Team immediately and at a very high knowledge level for the coming growth of the Company. All funding for this project over the past 24 years came from Britt and his Family along with a small number of interested seed-investors. Timely grants, coming from SBIR and NIH (National Institutes of Health) for nearly $1,500,000 allowed us to take the Hepatitis B vaccine through a successful double-blind, placebo-controlled, human clinical trial; obtaining FDA authorization for a second human trial. PlantPharm BioMed has now a fully developed Platform Technology and is fully prepared to move forward as an early-growth company. 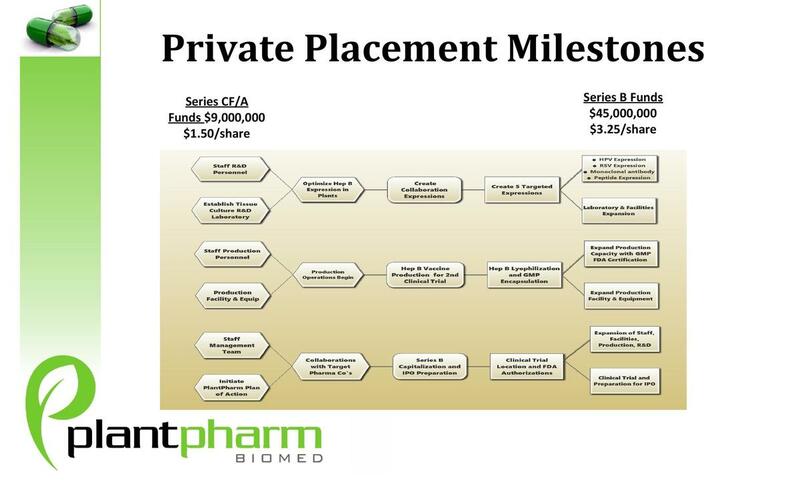 Each year has seen us reach milestones, proof-of-products, or documentation and publications that make PlantPharm a secure business entity, with a unique product for the biopharmaceutical market. We have people who have been involved since the very beginning of our work on this project and others who joined in each year and are still working with us. None of these people have asked to be paid during these years because they saw the value that their work could bring to humanity, and would be proud to be associated with PlantPharm when our doors open for business. We have been awarded several research grants from the National Institutes of Health on first application, and then succeeded in achieving the lofty goals. We have a certified BioSafety Level 2 Laboratory and pilot production plant to produce vaccine in potatoes. This massive body of work from a bootstrap-funded company allows us to answer any question about our work with documented authority and confidence. The last few years have brought us to this secure funding event today. Focus #1) The pharmaceutical industry is regulated by the Food and Drug Administration (FDA) and sales of biopharmaceuticals to customers can only be made upon receipt of a license issued by the FDA upon meeting specific criteria and human testing. The Company is quite far along in this regard and expects to have a marketable product available for sale within three years. Upon holding an FDA license, the sale of our first orally dosed vaccine will provide average sales on this product alone of more than $200 Million per year by year 4-5. 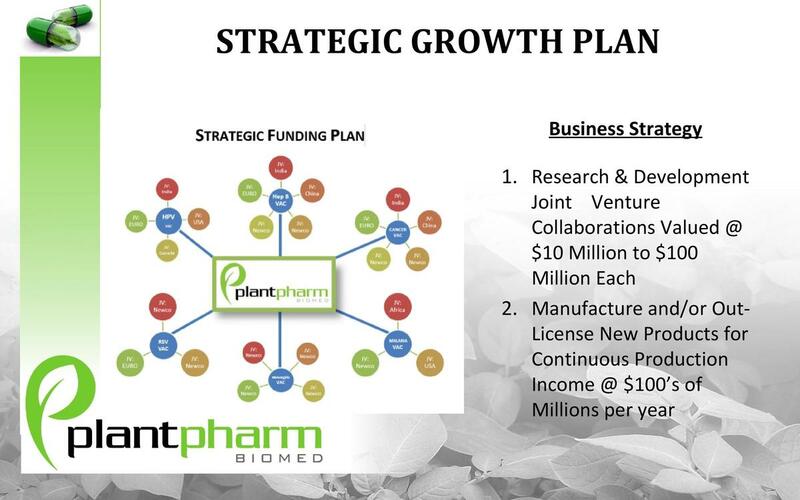 Focus #2) PlantPharm is unique compared with other Biopharma companies. We have a Platform Technology so the Company is not dependent upon a single drug passing FDA review. Additional customers include other pharmaceutical companies who utilize contract research organizations to bring a new product to marketability for them. PlantPharm, because of our Platform Technology, is able to collaborate or joint venture with many other firms to develop a plant-derived product for that organization (i.e., CMO Report: “Two-Thirds of Pharma Manufacturing is Outsourced”). The need for this type of relationship is important and is replicated by Big Pharma with smaller companies hundreds of times each year. Typically, revenues include upfront payments ($10M-$120M), research & development payments ($20M-$300M), milestone payments, and future royalty payments that can extend from hundreds of millions to a Billion dollars per year. This customer base will need PlantPharm’s expertise in Plant pharmaceutical production, and we are concentrating on the development of this Customer base beginning in the first year of business. Why is the Product or Service Unique? Biopharmaceuticals are formed using a living host in order to multiply a specific protein used as a human pharmaceutical. The production of biopharmaceuticals can come from Transgenic Plants, Plant Cell Culture, Bacteria, Yeast, Mammalian Cell Culture or Transgenic Animals. Bioreactor-based platforms support algae, moss, duckweed and carrot cells. Seed-based platforms support sexually produced plants and seeds. Animal cells are produced using live animals and animal products. Every one of these expression platforms has unique benefits and costs. Plants are the most efficient protein producers on the planet and do so without propagation of human pathogens or other mammalian contaminants. For transgenic plants, overall costs are very low; scale-up capacity is very high; production scale can be worldwide; protein yield is high; protein folding capacity is high; product quality is high; contamination risks are low; safety is high; and storage cost is inexpensive. (International Journal of Molecular Sciences). There are only two platforms that are comparable with Transgenic Plants in the production of biopharmaceuticals, and each has strengths and weaknesses. Of those two platforms one uses tobacco plants and is fast to implement but produces very low production of end-product. Importantly that platform is a non-stable transient expression platform. The other platform is PlantPharm’s, which uses potato plants and has the highest production capacity along with a very stable permanent expression platform. What do You Understand that Your Competitors Don’t Get? Orally delivered vaccines directly to the mucosal system is the preferred method for vaccination as the University of Gothenburg discovered in a recently published research paper. By vaccinating through the mucosal system a more permanent and effective immunization is created. A virus or bacteria normally enter the body through the mucosal system, i.e. the lungs or the intestines. Logically, stopping a pathogen as it first enters the body and before it enters the bloodstream is much more effective than waiting for it to progress into the blood stream. 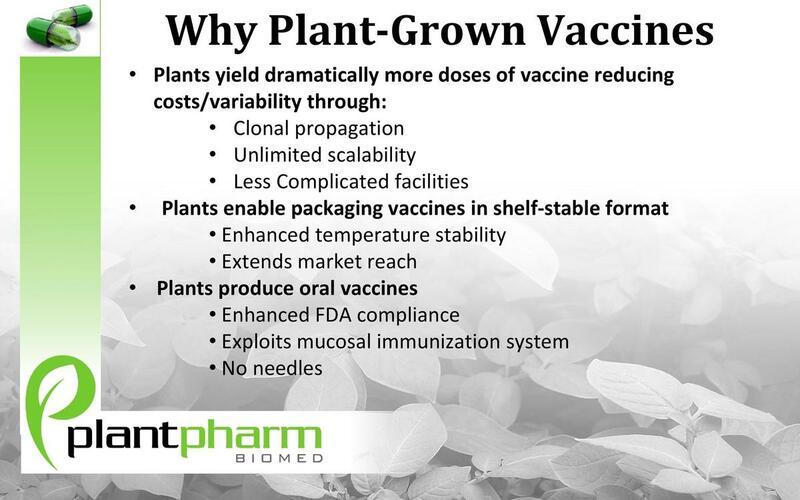 Producing vaccines in plants that are delivered orally through the gut, a much more effective immunization system is provided by PlantPharm. The problem of degradation by stomach acid is mitigated by the cellular structure of the plants themselves. Can You Discuss the Verticals You Have Gone After To Date, and Why? Future verticals will be the ability to manufacture vaccines and biosimilars by collaborating with companies to develop a plant-derived version of their own product. This will also lead to Joint Ventures and stand-alone companies that PlantPharm will proportionally own. International businesses will be developed and local production in specific locations will be achieved through Joint Ventures in each of those countries. What Makes a Successful Business in Your Field? Can You Talk About Several Companies you’d Like to Emulate? Juno Therapeutics – Started up in 2013 and was a model for PlantPharm at that time. Their IPO was launched at about $24 and in 2018 the company was purchased outright for $9,000,000,000 (Nine Billion Dollars). PlantPharm will follow a similar business strategy and drive up its Market Cap. Microsoft – It takes Microsoft software to make most personal computers run. Collaboration with many hardware manufacturers created Microsoft’s customer base. 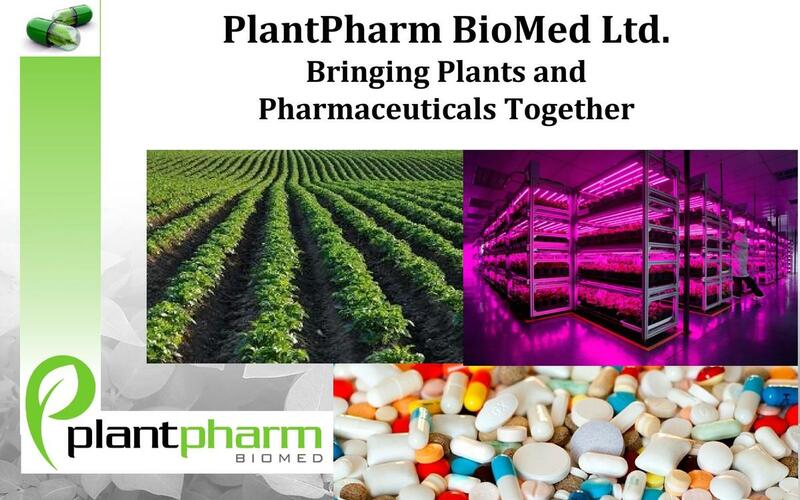 PlantPharm will be a collaborative company also and interact with many Big Pharma companies to convert their product lines into plant-derived drugs. Intel – I takes Intel chips to run many of the personal computers. Similar to Microsoft and Intel, it will take collaboration with PlantPharm as the go-to company for plant-grown biopharmaceuticals. 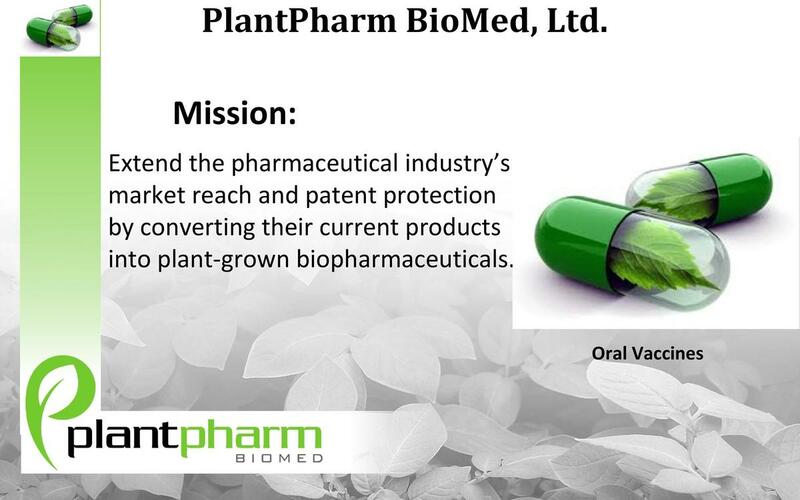 PlantPharm BioMed, Ltd. will operate to acquire customers via collaboration or Joint Ventures with big and small pharma and assisting to convert their current and future products into vaccines or biopharmaceuticals. PlantPharm will be capable of providing manufacturing services downstream, if required. Sell Me – I am a Potential Customer. Why Should I use Your Company/Product? It is less expensive and faster to produce a vaccine or biosimilar from plants. 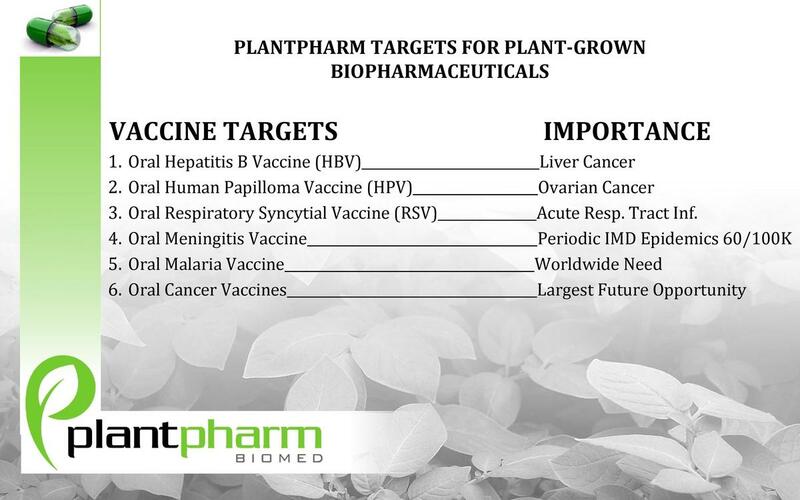 PlantPharm will provide conversion to plant-grown biopharmaceuticals which will provide a different and more effective delivery path for a vaccine and lengthen the life of any current patented drug. Collaboration with PlantPharm is the beginning of the path to make all this happen. + Conversion of current injection-based vaccines and biopharmaceuticals into plant-grown oral-based .vaccines and biopharmaceuticals.+ + Contract R&D services for the expression and production of new vaccines and biopharmaceuticals in plants.+ Ten of the highest revenue biopharmaceuticals projected for 2020 are suitable for production in potato plants using the PlantPharm Platform Technology as either monoclonal antibodies, therapeutic proteins or peptides. Total projected sales in 2020 for these 10 drugs is $65.26 billion. 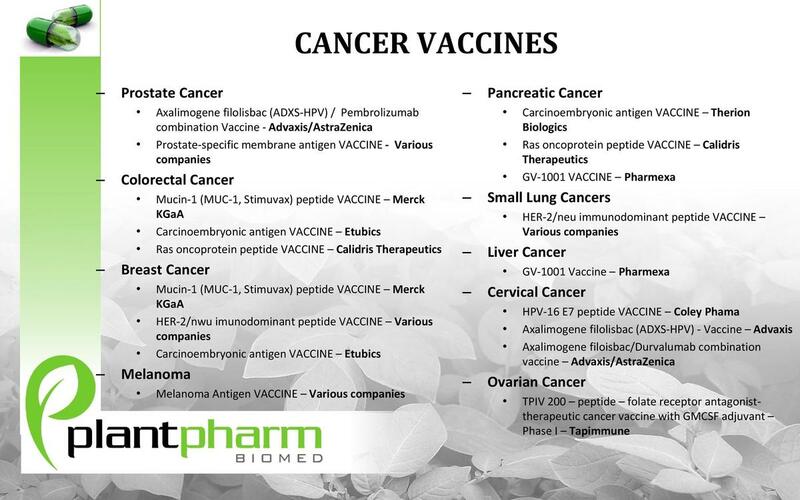 These drugs include some of the most recognizable names in biologics: Humira, Opdivo, Avastin, Herceptin, Soliris, Rituxan, Enbrel, Remicade, Keytruda, Eylea and represent the first wave of biologics introduced into such significant disease categories as cancer, psoriasis and rheumatoid arthritis. These can be converted to plant-grown drugs using PlantPharm’s Platform Technology.+ Contract R&D and manufacturing of less costly biosimilar versions of current drugs on the market. The pharmaceutical industry typically takes fifteen to twenty years to develop and introduce a new drug to the marketplace. PlantPharm has already invested this front-end time and is now in position to begin its drive to get its first vaccine to market within the next three years. During this time Contract R&D and manufacturing for 3rd party biopharma will allow them to get to market quickly with a new plant-based drug. What Ideas Do You Have for Growth in the Next 3 months? Within 3 months the company will be operational with production facilities and equipment identified for initiation the following Spring for the oral Hepatitis B vaccine. Research on a number of additional pre-identified vaccines will be underway in our lab. Within 12-months PlantPharm will have 5 to 7 new plant-grown versions of vaccines along with other biopharmaceuticals as proof-of-concept. We expect to patent 5 new products within the next year. Additionally, collaborations with pharmaceutical companies will be under contract. Scale-up of production operations will be underway. The pharmaceutical industry has a relatively small number of players. To spread the PlantPharm message, a significant amount of press will be devoted to the introduction of PlantPharm, its people and processes. Secondly, industry seminars, conventions and trade shows will be targeted for personal connections with decision-makers in the companies available for R&D conversion of drugs into plant-grown production. In addition to contract R&D, the manufacturing of vaccines and biopharmaceuticals from plants will become PlantPharm’s major earning vehicle and customer draw as the future develops. A downstream effect comes from the need to manufacture product after PlantPharm has made an R&D conversion of the plant. Because the manufacturing of drugs in plant-based systems is not a standard process within pharmaceutical companies, the manufacture of the end-product vaccine and biopharmaceutical will require PlantPharm’s special in-house capabilities. What is Your Lifetime Value and Cost of Customer Acquisition? Because of the compact nature of the pharmaceutical industry, the lifetime value of a customer is likely to be $100 Million to $20.0 Billion dollars. Customer acquisition costs are therefore relatively insignificant. How Will That Evolve As You Scale? We will establish long-term relationships and expect to be the sole plant-based R&D and manufacturing resource for our customers. We would expect to maintain a customer for 5-20 years once they are established. Because pharma companies have multiple product pipelines it is likely that these long-term relationships will be the norm. 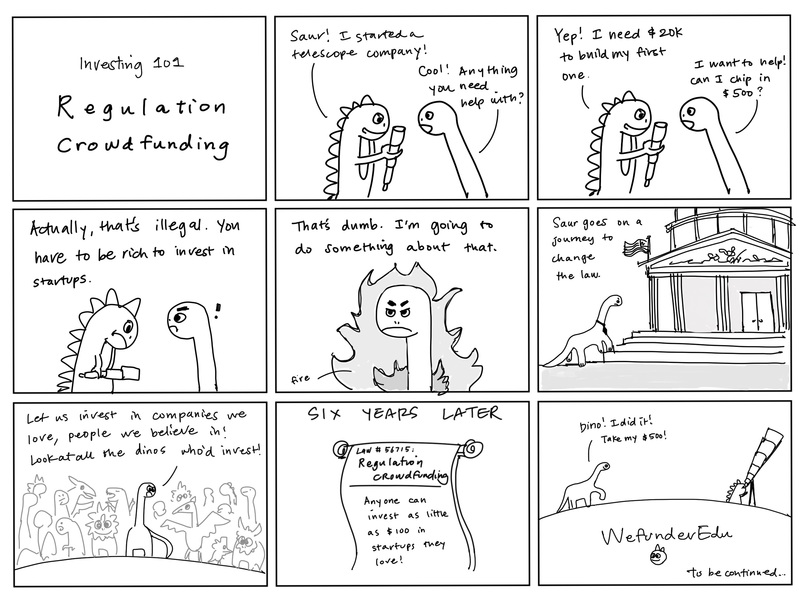 What’s Next For Your Business and Why Are You Raising Money Now? Because we have completed the lengthy R&D phase of our Platform Technology and demonstrated its ability to convert plants into vaccine-bearing and biopharmaceutical production powerhouses, we are now ready to acquire the facilities & equipment necessary to put plant-grown pharmaceuticals into the market. Extensive time and effort has gone into the proof-of-product and development of the Platform Technology. This effort was necessary to demonstrate our ability to replicate plant-grown vaccine and biopharmaceutical expression and production and put PlantPharm into a position to offer our services to the pharmaceutical industry. Have You Thought About Potential Exit Options? We are planning an Initial Public Offering within 24 to 36 months. Forward movement. It has taken many years to get to the point where we have proven the Platform Technology and shown that organic plants are able to multiply the biopharmaceutical products that we ask them to supply. I think about all of the human suffering we can alleviate…but cannot until we are fully up and running the business. Excite Me. 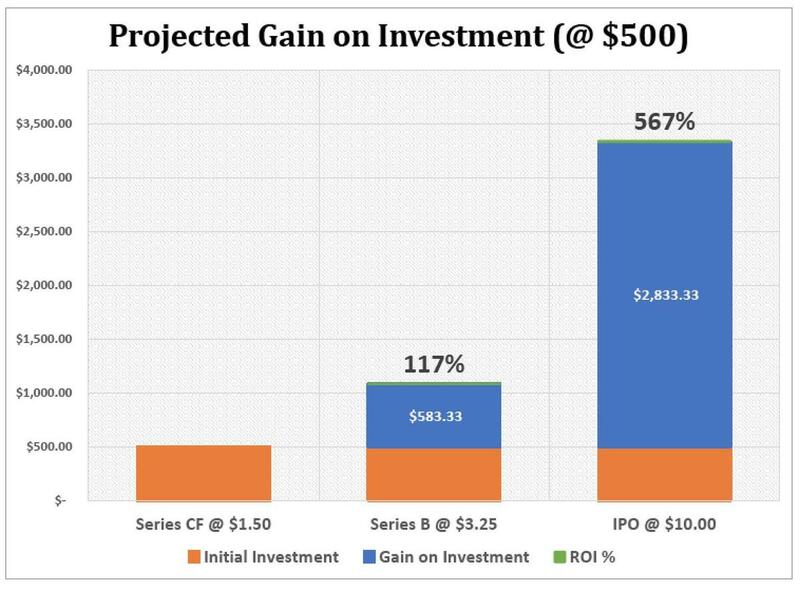 Why Should an Investor Invest in Your Company? “The global pharmaceutical market is valued at approximately $800 Billion USD with a projected growth to $1.2 Trillion by 2022”, as recently published by the World Health Organization (WHO). While growth in pharmaceutical spending worldwide is staggering, the biologic drug market is growing at nearly twice the pace of the overall pharmaceutical market. For you as an investor, this means the market is healthy and growing. There is also the humanitarian need to expand the reach of life-saving drugs to remote regions in third-world countries. In developed nations, the high price of new biological drugs is straining the health care system, challenging health insurance practices and limiting patient access. The FDA is currently examining strategies to reduce the price of biologic drugs and these strategies will involve all aspects of drug R&D and production. 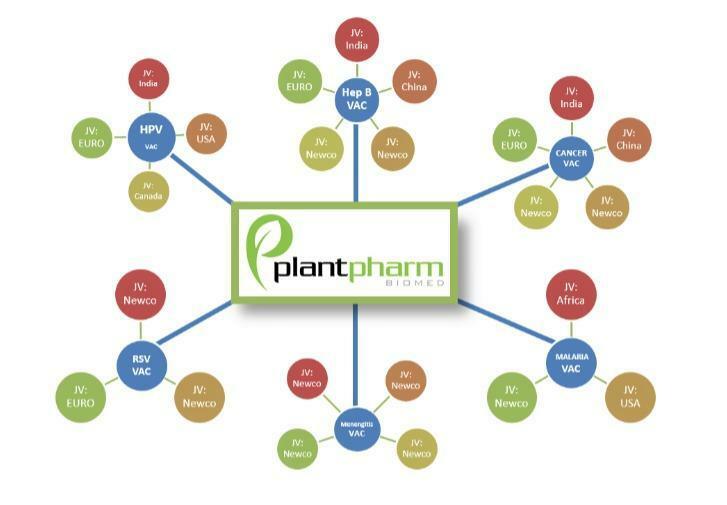 PlantPharm’s mission is to both expand vaccines access into third-world countries by reducing distribution problems and simultaneously to reduce the production cost and patient price of biologics in developed nations by employing its proprietary, plant-based biopharmaceutical manufacturing platform. 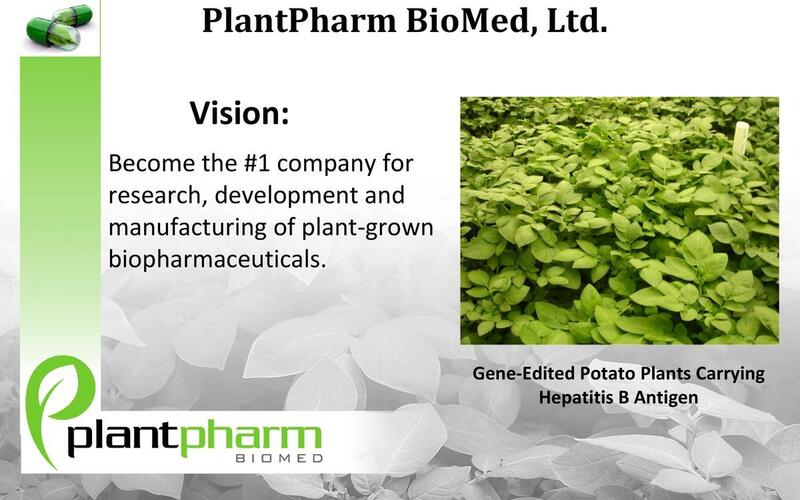 Historically, PlantPharm BioMed, Ltd. has led the field toward the development of biopharmaceuticals grown in plants for more than 20 years. Understanding the “How to do it?” is behind us and what is ahead of us is a world of nearly unlimited markets and hundreds of new therapies and vaccines that our Platform Technology is able to manufacture. For you as an investor, this means the business is secure.Of the 42 vaccines approved in the USA, 40 of them are delivered only by injection. PlantPharm’s Platform Technology can allow nearly all of those vaccines to be produced using plants and to deliver dosages as shelf-stable pills rather than a needles. Who wouldn’t rather take a pill than be stuck by a needle? For you as an investor, the choice is obvious.The humanitarian capabilities of plant-grown vaccines will allow developing countries, those without the ability to maintain cold-chain distribution required to protect liquid vaccines, to deliver shelf-stable, orally administered vaccines to people who would otherwise go without. PlantPharm will provide for that need. For you as an investor, this means less suffering in the world and you helped make it happen!Of all of the investments being made today, the biopharmaceutical sector is second only to the technology sector. We are part of a very hot investment marketplace. With the early earnings power of PlantPharm and the intention of exiting via an IPO in the near future, an investor in PlantPharm Biomed, Ltd. can be looking at a high return on their investment. For you as an investor, this means that your investment made today will reap large rewards in the not too distant future.We have built the platform and it has been tested and works as expected. PlantPharm BioMed will be fully functional and in growth-mode within hours of funding. For you as an investor, your capital will be working to create growth for you immediately, and humanity will benefit from your investment to an even greater degree. Our Team are very experienced professionals, each with an extensive background and expertise in the work that we are undertaking. PlantPharm is not going to suffer from lack of leadership experience. The senior management team have lifetime experience in the field and have all the skills the company needs in order to create a successful company.Robert Britt is the Founder, Chairman and CEO. This enterprise began with Britt family members doing all of the initial work. They are actively involved today and know the technology and manufacturing inside and out. We then brought other technical people into the mix with Dr. Thomas L. German, Professor Emeritus at the University of Wisconsin who held Chairs in both the Plant Pathology and Entomology Departments and he is currently our Chief Science Officer. Dr. Richard R. Matner, Ph.D., MBA came to PlantPharm with extensive operational and business development experience via a Fortune 50 company prior to his position as the Director of Technology Transfer and Commercial Development for Roswell Park Cancer Institute. Dr. Matner is PlantPharm’s President and Chief Strategy Officer.We have a Board of Directors made up of people who are outstanding in their fields: Dr. Robert Y. Ni – U.S. China Expert in Chinese medical needs; R.C. Suresh – Expertise in Middle East and India; along with several other professionals that shall be named later due to promised confidentiality.Our Technical Advisors are as follows: Legal/Corporate: Seymour Kremer Koch Lochowicz and Duquette LLP as local legal counsel. Auditing: Baker Tilly, Janesville, WIWe have a full complement of personnel ready to launch PlantPharm on the path to success. I must withhold names of most of the team because they presently hold other positions and I have promised confidentiality while awaiting the PlantPharm funding event. 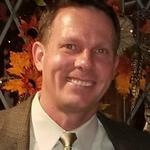 I can say this however: Our Director of Biomanufacturing is the primary Director of one of the noted plant research facilities in the world and is an automation and computerization expert.Our Vice President, and Chief Financial Officer has served with Baxter Healthcare, Abbott Laboratories, Walgreen’s and Ernst & Young accounting. He knows the industry well.Our Manager of Communications & Shareholder Relations is a highly regarded public relations, communications and marketing manager who interviewed me several years ago and impressed me then and has gone on to receive awards for work done.Our Production Manager has been involved in all production phases of plant-grown vaccines research and discovered much of the Trade Secret information compiled during the R&D phase of the Platform Technology. PlantPharm has financial statements ending December 31 2017. Our cash in hand is $18,000, as of November 2018. Over the three months prior, revenues averaged $0/month, cost of goods sold has averaged $0/month, and operational expenses have averaged $1,400/month. PlantPharm BioMed, Ltd. was incorporated in the State of Nevada in February 2008. Our Platform Technology is a new and proven organic production method for the pharmaceuticals industry. Humanitarian vaccination efforts worldwide are enhanced by being able to administer shelf-stable, oral vaccines without the need for a cold-chain environment and a needle. With our proprietary Platform we can economically produce pure biologic drugs and vaccines using plants resulting in lower costs of biopharmaceuticals in the future. Assets. As of December 31, 2017, the Company had total assets of $54,079, including $50,027 in cash. As of December 31, 2016, the Company had $56,747 in total assets, including $50,296 in cash. Net Loss. The Company has had net losses of $19,758 and net losses of $42,438 for the fiscal years ended December 31, 2017 and December 31, 2016, respectively. Liabilities. The Company's liabilities totaled $191,710 for the fiscal year ended December 31, 2017 and $174,621 for the fiscal year ended December 31, 2016. To-date, the company has been financed with $204,000 in debt. We will likely require additional financing in excess of the proceeds from the Offering in order to perform operations over the lifetime of the Company. Although our runway is longer, we plan to raise capital in 5 months. Except as otherwise described in this Form C, we do not have additional sources of capital other than the proceeds from the offering. Because of the complexities and uncertainties in establishing a new business strategy, it is not possible to adequately project whether the proceeds of this offering will be sufficient to enable us to implement our strategy. This complexity and uncertainty will be increased if less than the maximum amount of securities offered in this offering is sold. The Company intends to raise additional capital in the future from investors. Although capital may be available for early-stage companies, there is no guarantee that the Company will receive any investments from investors. 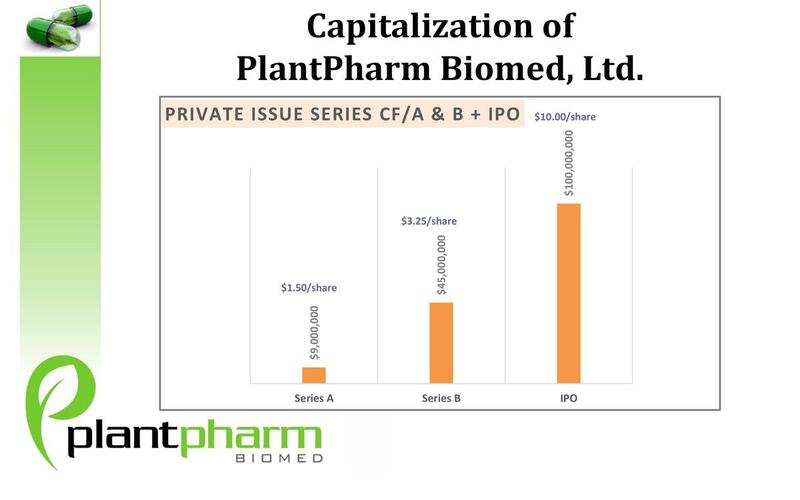 PlantPharm BioMed, Ltd. cash in hand is $18,000, as of September 2018. Over the last three months, revenues have averaged $0/month, cost of goods sold has averaged $0/month, and operational expenses have averaged $1,400/month, for an average burn rate of $1,400 per month. Our intent is to be profitable in 24 months. No changes have occurred in our finances since the date of our statements. This business is operating as a Research & Development operation in its funding stage (without revenues) with future revenues regulated by the U.S. Food and Drug Administration licensing of the Company's biopharma vaccines for sale. Additionally, the Company expects its first vaccine approval within 24-30 months. Although we cannot guarantee it, we expect added revenues will occur within 6-12 months from financing date via collaboration agreements with other Pharmaceutical companies that will convert their current vaccines into plant-grown vaccines and biotherapeutics by contacting the Company's Platform Technology. Although we cannot guarantee it, we expect that Wefunder capital will give the Company the ability to market itself to raise the Series A and Series B Equity funding prior to the Initial Public Offering (IPO) of its stock. During the short-term, funding will continue to cover expenses as it has in the past years of development supported by its Founder. As a going concern, the Company will be required to raise additional funds from subsequent issues and the failure to do so could materially affect the future of the Company. The Company competes against larger firms, which are financially stronger and may limit the Company's access to qualified personnel or business opportunities in the future. The Company intends to sign development and joint venture contracts to use its proprietary platform to develop therapeutics, biosimilars, and vaccines in conjunction with larger pharmaceutical organizations but has no current agreements signed and in effect. The Company is dependent upon interaction with the U.S. Food and Drug Administration for authorization and licensing of any biopharmaceutical products prior to sale and this could cause delays in expected revenues. Future filings of Patents by the Company in both the United States and Foreign Countries and may not have sufficient funds to defend against violators of those Patents in the early development of the Company. Cheryl J. Dillner is a part-time officer. As such, it is likely that the company will not make the same progress as it would if that were not the case. Management plans to finalize its Series A and then Series B investments and then offer the Company to the public in an IPO, but market conditions and other outside influences could cause this plan to be modified in ways Management cannot envision at this time. The Company has received a third-party, pre-money valuation of its Trade Secrets Platform Technology of $256,000,000. Such valuation cannot be included in the Company's Balance Sheet according to GAAP Financials. As a result crowdfunding investors without Biopharmaceutical experience might not understand and therefore could misjudge this opportunity. The Company does not yet generate revenue and may not generate revenue in the near future. To date, the Company has been largely funded by its founders. Related party loan with no interest rate and no set maturity date. The maturity date will be determined by management, and is expected to occur as the Company begins generating revenue. $100,002 30% toward Business Development, 20% toward Facility & Equipment, 45% toward R&D, 5% toward WeFunder Fees. $1,069,998 30% toward Business Development, 20% toward Facility & Equipment, 45% toward R&D, 5% toward WeFunder Fees. 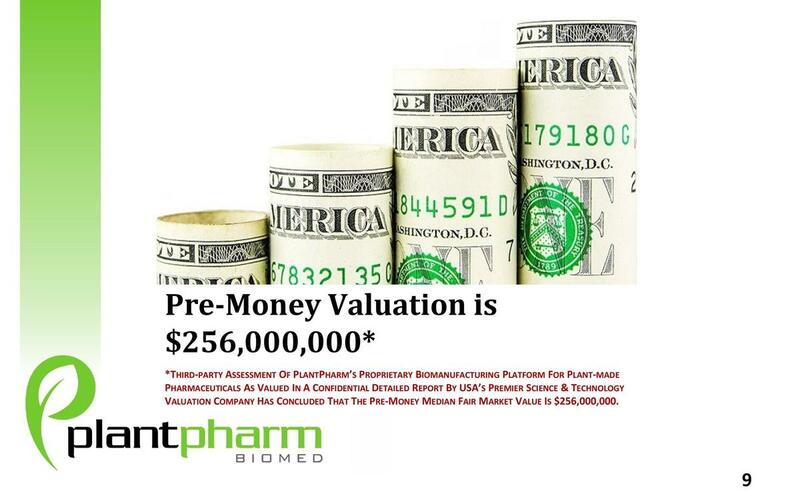 PlantPharm is conducting a Regulation Crowdfunding offering via Wefunder Portal LLC. CRD Number: #283503. Potential for successful Vaccines delivered in Plant based form. I invested because we need change in vaccination industry! Hopefully this will help create less dangerous vaccine's for kids! Maybe we can put 1 vaccine per pill as opposed to 3-6! I feel innovations like this have the power to change the world. I believe in the product and the good it can do. I read the information and believe that's a great and promising discover. I believe in your project! I would gladly give several thousand in the hopes that a such a change in the technologies and processes surrounding vaccines could actually be realized. The number of lives that could be saved world-wide is staggering. THIS is the kind of thing we should be focusing on! This is a global game changer. It brings the potential for millions to benefit and be healthy and get healthy. Do just a little digging on their website and you'll understand the way cool affect it can have on vaccine delivery. Very exciting possibilities. Hello my mame is Juriys Voronetskis. I wish us Good Luck )! Let me know if I can help you in any way. 77 yo retired family doctor.